nontime111 and Old Kogarah Boy 1 like this. As hard as it is, i went with my gut as to who on their BEST day, would be in there. So, i present the following based on nothing but they could turn a game. The simple answer here is the 2010 grand final winning team, but I’ll try mixing it up a bit. Prepare for a few controversial choices. IMO laughable people putting in Hunt and Vaughan who are yet to deliver on a week in week out basis. I thought Vaughan was great in his 1st year but well down on that form last year prior to injury. Hunt has a long way to go to show he can organise this current team and I'm positive Head would have loved to have been the half in the side above. nontime111 and Saint_JimmyG like this. Your a hard man putting Ryles ahead of Craig Smith, even Weyman. To me, Ryles costs us more games than won us. Smith was a great captain and gave his all and Wyman was peaking with us. Bailey was an excellent player for us as well. I was trying to think who the player was that, 'had a head like a smacked A-hole' .............. and the name, Darren Tracey came to me. Every opposition player hated him but l liked his mongrel style. Were you drunk when you posted this? Reread my message slowly. Ryles was a good player but was a soft target for refs to penalize and his running style wasn't so effective. Opposition got under him and drove him back a little often for my liking. 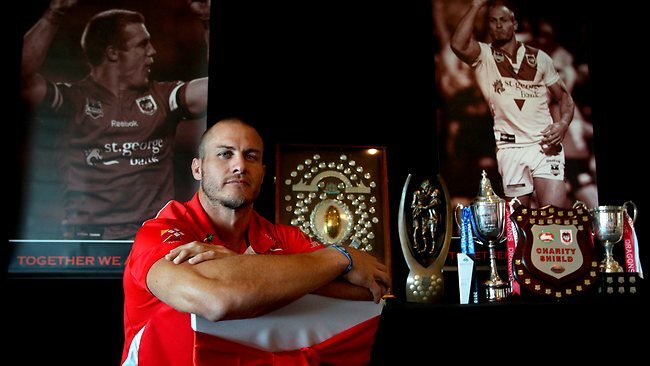 WhatsYour top 17 players for the Dragons last 20 years. I'll just say anyone leaving Tingha out must have never seen him play. He was/is a good bloke. For perspective, Nighty scored 110 tries in 266 games for us. Old Timer, nontime111 and blacksafake like this. Irrespective of feelings towards Mundine he has to be there. nontime111 and DragonJ like this. I could only tolerate Mundine for a maximum of 80 mins a week. Conveniently, a game of football runs for 80 minutes. J. Smith for Bartrim and l'd love to find room for Beau Scott & Craig Smith but apart from that, it's a dam good team. Saints of George likes this. To be fair, my team was mainly built on who I considered good club men, but you're absolutely right, J.Smith, Scott and C.Smith were all guns too! I always hold Mark Coyne in very high esteem for what he did in '99. Yes it was his last year and the back end of it he saw injured on the sidelines and will be remembered as a St.George legend as opposed to a St.George Illawarra legend but, he was our first captain as a JV club (which I imagine wouldn't have been an easy task) and what's more impressive is that I remember reading at the time of the '99 GF, he actually overcame his injury in time for the '99 finals but unselfishly gave up his spot in the team and his spot to captain the team in the GF to not break up the winning combination that got the club there in the first place and essentially not taking the spot of Shaun Timmins. That reason alone is why he's in my team. Unselfish leadership from our captain who put the team before his own glory. Unlike a certain other captain we had in 2008 who pissed off to France and cost us a promising Josh Morris. blacksafake, Old Timer, Old Kogarah Boy 1 and 1 other person like this. 100% agree on this .. and you can’t argue on the results - minor premierships, premiership, world club championship.